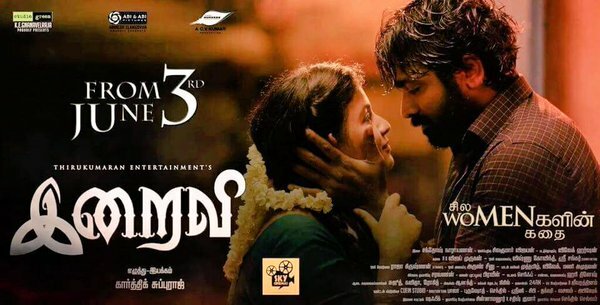 Karthik Subbaraj directorial forthcoming film Iraivi is all set to entertain audience from June 3rd and makers are planning for huge release. Trade Sources reveals that Iraivi will be releasing in record screens across the globe as expectations over it are sky rocketing. Vijay Sethupathi, SJ Suryah and Bobby Simhaa are playing male lead characters in this thriller. Anjali, Kamalinee Mukherjee and Pooja Devarah are essaying female lead roles. D Imman is the music composer and DOP is by Sivakumar Vijayan. CV Kumar is producing Iraivi and Studio Green to distribute it. Write & Share about "Iraivi set for wider release on 3rd June | Iraivi Tamil Movie News | Cinema Profile" !